Product Description The Koehler K16203 is for flash point determinations of fuels, lubricating oils, liquids containing suspended solids & liquids that tend to form a surface film during testing. 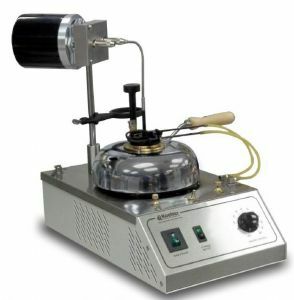 Includes Brass Test Cup with Handle & thermometer holder and the K16225 stirrer motor. Slow speed gear motor rotates stirrer of Pensky-Martens Tester at 115rpm for Procedure A and at 250rpm for Procedure B. Includes adjustable support bracket and mounting rod. Installs in base of flash tester. FROM MANUFACTURERS LITERATURE: Determines flash points of a wide range of products by a closed cup method with two option speed stirring of the sample. Extensively used in shipping and safety regulations for detection of contamination by volatile and flammable materials in fuel oils and lubricating oils, and for characterization of hazardous waste samples. Smooth operating cover mechanism slides shutter open and applies test flame at the turn of a knob. Cover fits over brass test cup and includes pilot flame, test flame reference bead, built-in stirrer and plated brass thermometer ferrule. Electrically heated model is equipped with a 1000W nickel-chromium heater with stepless variable control for accurate, repeatable temperature rate of rise settings per specifications. Heater unit is enclosed in a stainless steel housing with cooling vents. Includes line cord receptacle and switch for accessory slow speed stirrer. Gas heated model has a built-in nickel plated brass natural gas burner, or can be supplied with an artificial gas burner or liquid propane burner (specify when ordering). Both models are mounted on a sturdy cast iron base.